A Morton’s Neuroma is a swelling of a nerve that runs between the bones of the foot. There is pain on standing, which gets worse with time, especially when wearing closed leather shoes. The pain is usually, but not always, better in sandals, trainers and bare feet. The nerve entrapment leads to pins and needles in adjacent toes, or shooting pains. Sometimes the toes become splayed apart over time. The symptoms of a Morton’s Neuroma can arise because the nerve is entrapped and has become swollen on one side – this makes the entrapment worse. Sometimes the symptoms are caused by a bag of fluid which forms as a lubricant between two bones. This bag can contain inflammatory chemicals that irritate the nerve. The problem usually arises between the third and fourth toes, and the second and third toes. Between the third and fourth toes, lots of nerves come together. If you have similar symptoms, it is best to see an orthopaedic surgeon who specialises in foot and ankle surgery. You should have x-rays taken in a standing position – this will allow other conditions of the forefoot to be excluded. There are lots of causes for pain in the forefoot, and Morton’s Neuroma is only one of them. 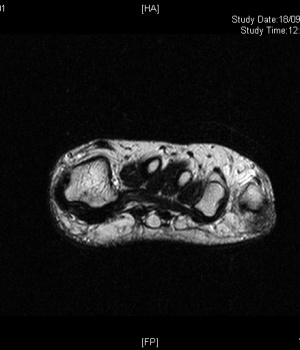 If there is any doubt, then an MRI scan or an ultrasound scan may demonstrate a neuroma, but often they are not sensitive enough to pick them up. A full clinical examination and an injection is the best way to properly identify the neuroma. Many surgeons perform the traditional operation for a Morton’s Neuroma – surgically cutting out the nerve. In 4 out of 5 patients, this is successful, but in 1 out of 5 patients, there are residual symptoms, or the pain can even get worse. The other disadvantage of cutting out the nerve is that there is an area of numbness on the sole of the foot and the toes that the nerve would normally go to. 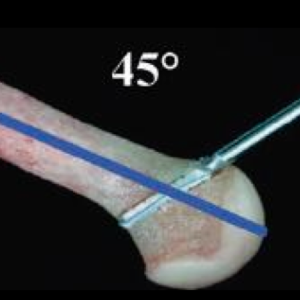 Sometimes, the raw end of the cut nerve is very sensitive and can result in a lot of pain, or a nerve condition called complex regional pain syndrome. In the condition called Morton’s Neuroma, the nerve causes pain because it is under excessive pressure. It is similar in many ways to carpal tunnel syndrome in the wrist. However, rather than relieve the excessive pressure, many surgeons continue to cut out the nerve. I believe that cutting the nerve is not necessary. Instead, I prefer to relieve the pressure by lifting the metatarsal bones away from the nerves, thereby relieving the pressure on it. This method is described in the research literature in a large patient series, and since I started using it, I have not had any patients with recurrent painful symptoms after surgery. I was the first in the UK to describe this technique and present my results for scrutiny. The metatarsal bones on either side of the affected nerve are cut, elevated and then fixed in a new position. This means that less weight is borne by those two rays. It is best indicated when there is pain on weight bearing, but there is no pain when not weight bearing. 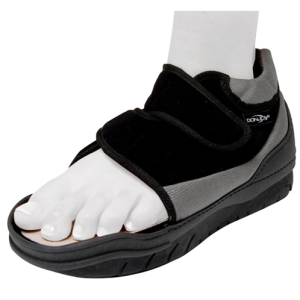 After Surgery, you will wear a special postoperative shoe. This is designed to protect your foot by relieving pressure from the forefoot, allowing you to walk, but not disturbing the screws in the forefoot. I advise patients to wear the shoe day and night for two weeks – even in bed. After this, the toes can be exercised by bending them towards the ground. The shoe must be worn for all weight bearing for a further four weeks. If an xray at this point is satisfactory, then the shoe can be discarded. As a bone has been broken, there will be some pain, but this should settle by around 6 weeks. Usually, the Morton’s Neuroma pain has settled, but the operation pain can take longer, although it does eventually settle.